Sri Lanka Army (SLA) officials informed the Sri Lanka Monitoring Mission (SLMM) and the Liberation Tigers of Tamil Eelam (LTTE) representatives who were present at Muhamalai Monday evening that the Sri Lanka's Peace Secretariat in Colombo had declined permission to the SLA Jaffna Commander, Maj. Gen. Sunil Tennakoon, to attend the proposed meeting with the LTTE, sources at the LTTE Peace Secretariat in Kilinochchi told TamilNet. 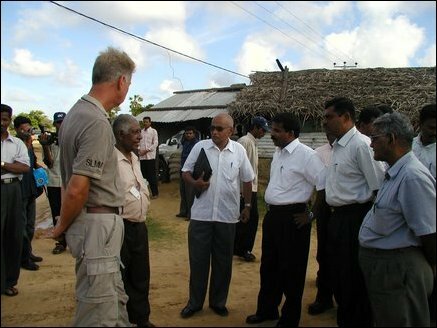 Sri Lankan officials informing Colombo's decision to the Scandinavian truce monitors SLMM and the Tigers. The meeting was expected to take place within the next few days, according to SLMM sources. Meanwhile, the new Commander of the Sri Lanka Army, Lt. Gen. Sarath Fonseka, will assume duties on Tuesday as the 18th commander of the SLA. Sarath Fonseka has been elevated from Major general to the rank of Lieutenent General by the Lankan President Mr. Mahinda Rajapakse.